2:15 PM: The tarp is off the field! We are expecting an on-time first pitch, dry weather, and a great ballgame against the Quakes tonight! Los Caballos de Stockton are back! Silver Sluggers: CLICK HERE to purchase your 2019 tickets - it's only $25 to attend every Wednesday home game! Download a Ports 2019 Game Schedule HERE! Opening Night is April 4 - mark your calendars! A ticket to all half (35) or all (70) home games is the most valuable item at the ballpark! Our members get 15% off a the team store all season long, flexible exchange policy, and GUARANTEED giveaways! What are you waiting for?! You love spending time with us and catching a glimpse of the future stars of the Oakland A's. The problem is, you've got so many things to do! A customized mini-plan membership will allow you to spend time at the ballpark without losing track of your summer! VISALIA, Calif.- The Stockton Ports rallied for the game-tying run in the top of the ninth, only to see the Visalia Rawhide win in the bottom of the ninth on Monday night at Recreation Ballpark. An exclusive club for fans 55 and wiser! 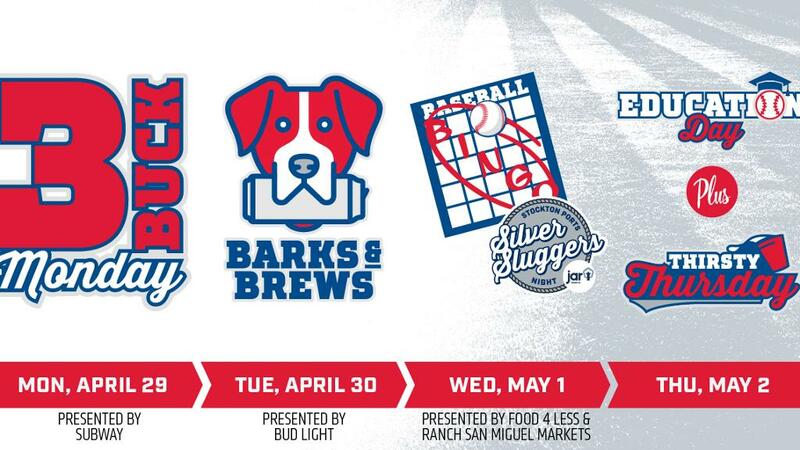 Our Silver Sluggers get a ticket to every Wednesday game and a t-shirt for just $30! All kids 14 and under are welcome to join, and get special game opportunities (first pitch, guest PA announcer) a ticket to every Sunday home game, 50% off Kids' Zones on Sundays, and more! Rated by ESPN as one of the Top 10 places in the country to watch a baseball game. Bring your glove! Our largest picnic area holds over 300 people. Kick back and enjoy an all-you-can-eat picnic, then enjoy a seat down the third base line. The most comfortable seats in the house, perfect for groups of 10-24 people who want a great view of the park. So fun and local! Great and affordable time for couples, families, seniors and wonderful for people with disabilities as well. Always have a wonderful time!